This customizable sofa is available in widths from 66 to 100 inches. Completely customizable from the back to the legs, this sofa is totally unique and all about you. Choose from 1,800 fabrics or leathers, a loose or attached back, seven arm and four base choices, seat and back cushion designs, and throw pillow options. So create whatever your heart desires, and design a look that fits your lifestyle and your personal taste. The 1000 Multiple Length CustomSeries Multiple Length Custom Sofa by Century at AHFA in the area. Product availability may vary. Contact us for the most current availability on this product. Arm You can choose from 7 arm styles to create a look that you love. Choose from Straight Cushion English Arms, Pleated Arms, Lawson Arms, Sloped Track Arms, Envelope Arms, Sock Arms, or Track Arms. Leg or Skirt You can choose from four base options in this collection. 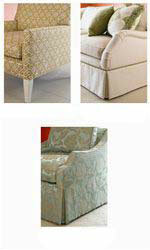 Choose from exposed wood Tapered Square Legs, exposed wood Turned Bun Leg, an Upholstered leg, and a Dressmaker leg. 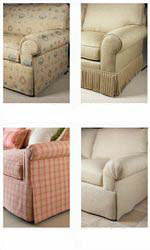 Are you looking for the perfect living room furniture but just can't seem to find it anywhere? Look no further than this collection where you can create exactly what you are looking for, down to the style of arm and welts on the cushions. In this collection you can design a sofa, chair and a half, chair, and ottoman to look exactly how you want it, in the fabric, texture, and color of your choice. Available in multiple lengths, you can design a sofa between 66 and 100 inches long, choose from seven arm and four base styles, select seat and cushion designs, and choose from over 1,800 in stock fabrics and leathers. So if you want contemporary, traditional, cottage, casual, coastal, or any style in between, then this is the perfect collection for you. So stop searching through hundreds of stores and designers and get what you really want; furniture for your living room that suits your individual style, tastes, and your family's lifestyle. The 1000 Multiple Length CustomSeries collection is a great option if you are looking for furniture in the area. Browse other items in the 1000 Multiple Length CustomSeries collection from AHFA in the area.